It’s Like a Salad Only Meatier…. After a month of burgers and skillets full of melted cheese, I decide it was time to mix in a few salads. As I have gotten older I have come to appreciate the healthful benefits of a good salad. All those fibrous greens and veggies really keep things moving along, but my favorite thing about salad is that it’s a great vessel for grilled meat. This week we made a Greek style salad with feta cheese, cucumbers and citrus vinaigrette and topped it with grilled pork slovaki. 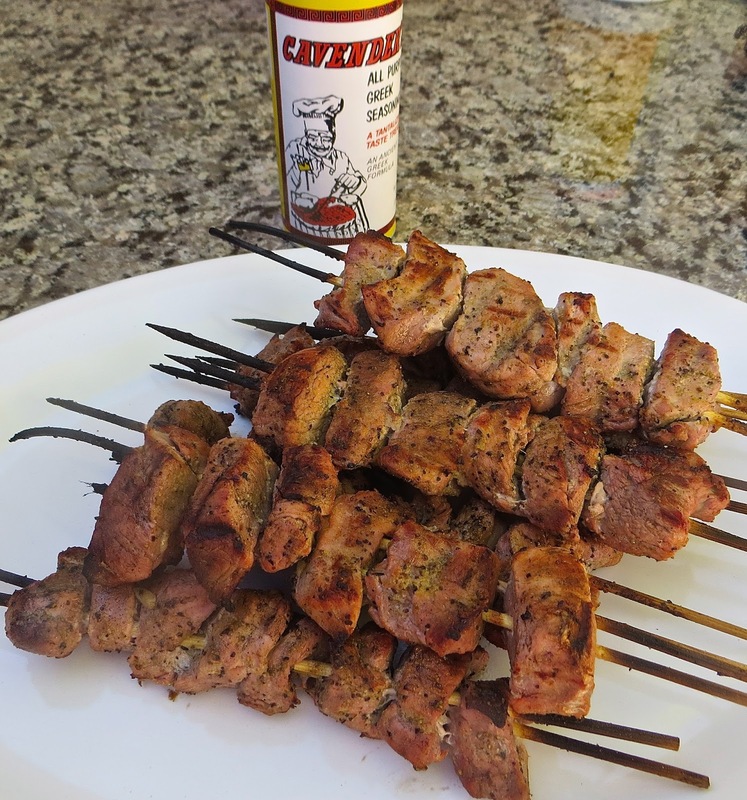 The pork slovaki is really easy and really tasty, too. I started with a pork tenderloin, cleaned off any excess fat and silver skin, then cut it into 1” inch pieces. Since I was going to skewer the pork I needed each piece to be cut as uniform as possible so they would cook evenly. After the pieces were cut, I tossed them in a large ziplock bag with a ¼ cup of lemon juice, 2-3 crushed cloves of garlic and 2-3 tablespoons of olive oil. Once the bag was sealed I worked the marinate into the meat then refrigerated for an hour or so. After the pork was well marinated it was time to skewer and season it. I soaked my wooden skewers in warm water for 15 minutes to help keep them from burning up on the grill. I also used a double skewer to keep the meat from rolling around. I threaded 6 chunks of meat on the sticks then seasoned with Cavenders All Purpose Greek Seasoning. I first tasted Cavenders over 20 years ago at a dinner party at a friend’s house. I bought a bottle of it on my way home and have been using it ever since. You could say, it was one of my inspirations to create my own rubs. Pork is grilled and ready to eat. Cooking the slovaki is pretty quick, 8-10 minutes. 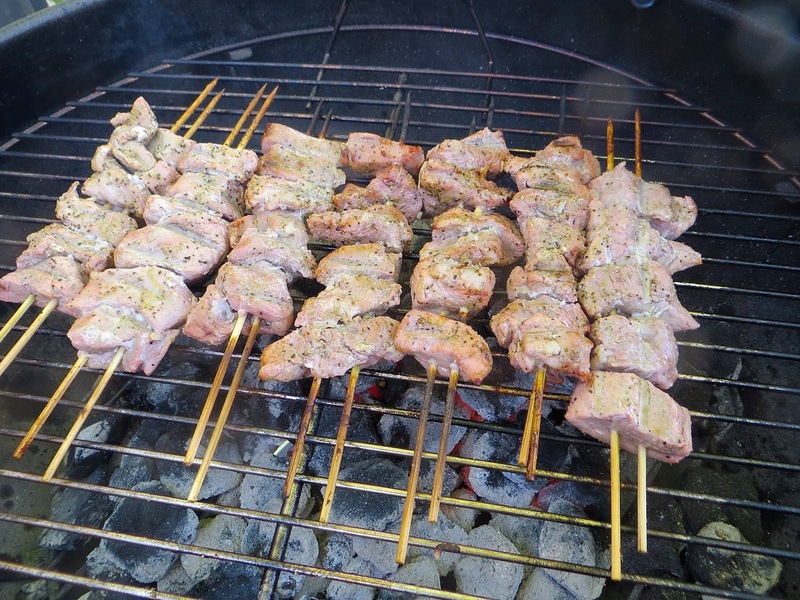 Just be sure to temp the pieces of pork in the middle of the kabob, it should be over 140º. I like to be sure mine are done so I cook them closer to 150º. I’ve served some raw pork before and it was not a pretty scene, Cheryl and Trissi have not let me forget it either. 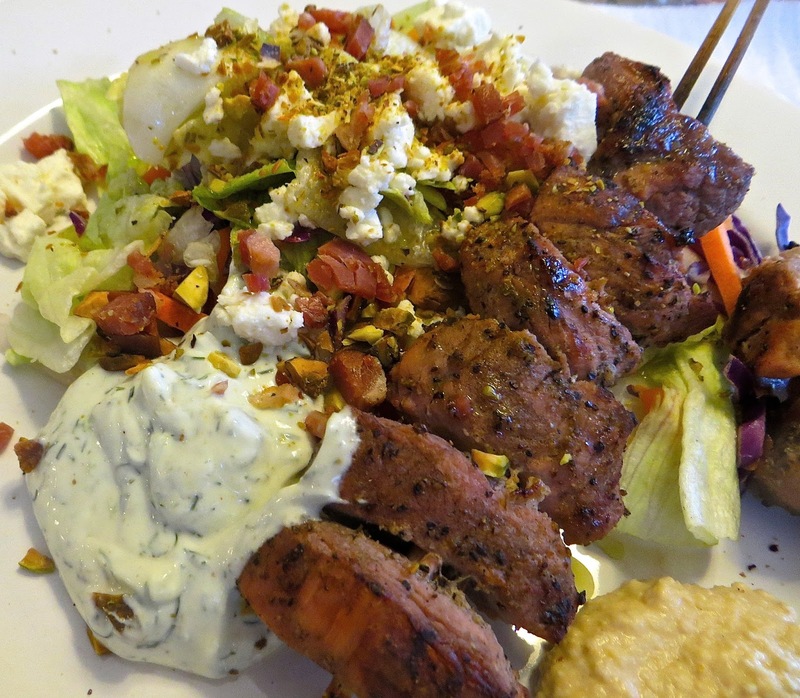 I covered my plate with a big pile of salad and topped it with a hot skewer of slovaki, a big dollop of tzakiki sauce, a couple of pitas and some hummus and dinner was on! The slovaki was perfectly cooked, it had a perfect balance of seasoning and tangy essence of lemon. Pair that will the cool crunch of the fresh greens and veggies, it was so good I completely forgot this was a healthy meal. Yeah, I think I’m going to eat quite a few more of these salads to help get his burger weight of, but at least I won’t be suffering. Good lord I love tzatziki sauce, one of the best condiments ever invented.